Hi Marge – Thank you for writing! Do feel free to keep your little one on two naps on the days where she is home with you, and perhaps an early bedtime on those daycare days is in order so that she does not get over-tired? Good luck Marge and please contact us if you need more help with this!! We are currently trying to change my 8 month olds schedule. I used to let her sleep until she woke up which was usually around 930 or 10. Of course this would end up with her staying up late and sleeping longer the next day. It just got later and later. So I initiated an earlier wake-up time…so she is on two naps a day and bedtime by 7:30. The problem is she will sleep for an hour and a half at bedtime and then wake up and cry or just stand up in her crib until I pick her up and then she will cry if I don’t take her out into the family room to stay awake. How do I get her to understand that bedtime isn’t a third nap since she’s so used to staying up late? please can you help. My grandson is 8months old as has never slept through the night, he screams really loud for at least 2 hours when you put him in his cot. The only way he will sleep is if he is feeding off his mum and she lays next to him, as soon as she leaves he screams again. He hardly has sleep at night and only has a couple of cat naps in day. My daughter is so tired and doesn’t know what more she can do – please can you help. My daughter is 8 months old and at night she only stops crying when she wakes up if I go to her. My husband tries but she only wants me. I breastfeed her still. What can I do to change this. She hates bottles. @Kelly – Thank you for reading and for sharing! Night feedings can really be confusing especially as you try to figure out if it’s truly hunger waking him vs habit. It’s a common question we help parents figure out and work through. If your little guy is truly hungry, yes, please feed him and he’s likely to happily go back to sleep (though sometimes habit will lead to this, too, unfortunately). It’s not uncommon for a 7-month old to still need 1-2 night feedings. Hang in there, Kelly – and please let us know if you need any further help working through this! My daughter recently has begun to sleep in 30-60min increments and is wide awake and fights going back to sleep. She used to sleep through the night with a handful of wakings where she would take her paci and go straight back to sleep. To top it all off, my husband started a third shift job this week so I am on my own. Last night was the worst. She was up at least 10 times and I finally brought her in bed with me and she went straight to sleep at 4am. I know this is bad, but I am not sure what else to do. I have never done any sort of CIO and am strongly against it. Honestly, I can’t stand her crying. I need to reassure her. But nothing is working. I am not even sure there is anything else I can do. Do I just have to let us both be sleep deprived and be stressed all night? Thank you for writing us. I’m sorry to hear that your daughter is struggling with SO many night wakings!! You’re not alone! You do not need to settle for sleep deprivation! We can help and can help with gentler and holistic methods to get you both back on track!Since you are really stressed and sleep deprived, I do believe you could benefit from one of our Personalized Sleep Consultation packages, our most popular option for help. In our consultations, we will work with you on a detailed plan to which you can commit and feel good about. All of our email consultation packages for new clients include a Personalized Sleep Plan, which is a detailed guide written just for your family. Most of all, hang in there Kristen! You are NOT alone and we ARE here to help!! So my sleep problems with my baby have changed drastically from my sleep problems last month. Aside from a few problems with getting naps down, my baby started sleeping 11-12 hours a night when she was 3-4 months old. Very blessed that she slept so well at night, only waking to feed a couple times and NEVER crying. Right when she turned 7 months she got two teeth and didn’t handle it well so we lost sleep at night there, then between 7.5 months and 8 months she learned to crawl, sit up, sit up on her knees, say new “words”, and stand with support. So we didn’t sleep the entire time she was 7 months. Now she has been 8 months for 8 days and has been obsessed with trying to pull herself up on the couch and coffee table and what not. And now every night she wakes up several times screaming which she’s never done before, and screams bloody murder if I lay her down for a nap, so I’ve had to stick around for naps and bedtime so it takes soooo much longer for her to go to sleep because she’s not used to me being there when she falls asleep and she thinks it’s time to play. We are in such a tough spot right now as I feel like I spend a ridiculous amount of time trying to get her to sleep, but if I don’t she will gladly stay up for 13 hours straight. I need to know if it’s time to drop the third nap and if so, how much time should I allow her to stay awake between the second nap and bedtime? And also, I don’t do cry it out unless it’s “mellow crying” and no longer than five minutes so I don’t know what to do about the blood curdling screams so I’ve just been laying with her and reading and nursing her til she falls asleep. When will this end and is there anything I can do that I’m not doing??? Hang in there and let us know if you have any other questions! My 10 month has started waking up during the night crying and will not go back to sleep unless rocked or if bring him into my bed. I’ve tried the cry it out method as this is what we did to get him to fall asleep on his own but this did not work. He has always been a good sleeper and if he woke during the night I would just put his dummy in or put his shusher on and he would go straight back to sleep. What else can I try? @Chantel – Thank you for stopping by our sleepy little village and for reading. 10-months can definitely be a tricky time for sleep, especially if sleep starts to fail after it’d been going well for a while, so I feel your pain! If your little guy is truly going through the regression, as mentioned in the article, this too shall pass so your patience will go a long way to getting you through this period. And while we do recommend supporting your babies during any discomfort, we don’t advocate creating long-term habits for a short-term phase. If you find that you need more support during this time, we’d love to help you – take a moment to read more about our consultants (www.babysleepsite.com/about) and consider connecting with one whenever you’re ready. Hang in there, Chantel! Thank you for reading The Baby Sleep Site! I’m so sorry to hear that you’re struggling with your son’s current schedule and getting him to sleep enough. We’d love to help! Would you please email us at contact@babysleepsite.com with a little more information about what happened, how long it’s been going on, and his current schedule? We’d be happy to recommend some resources for you. We look forward to hearing from you! Please help im very concerned about my sons sleeping patterns ever since he was 3 months he has never slept for more then an hour or two , he is 8 months now and still constantly waking up crying to be fed or needs a pacifier, he crawls around and tosses and turns in his sleep too , how do i fix this how do i get him to sleep longer at night ? @Melisa – Thank you for stopping by our sleepy little village, though I’m sorry to hear your little guy has been sleeping so terribly for you all. I know you must be exhausted. ? If you all haven’t considered a more structured approach to helping him sleep better, you should read this series of articles for tips on how to teach him the skills that he needs to be able to learn how to sleep on his own, too. 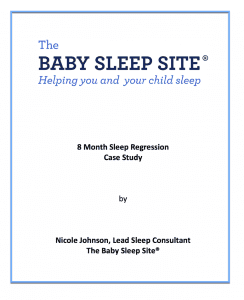 It will also give you an overview of sleep training techniques: https://www.babysleepsite.com/sleep-training/sleep-training-from-no-cry-to-cry-series-part-1/ If you find you need more support or have questions, please consider connecting with one of our sleep consultants – you can read more about our lovely ladies here: http://www.babysleepsite.com/about Hang in there, Melisa! We recently moved and our 8 month old’s sleeping patterns have definitely regressed. She has become very needy and has to be breastfeeding to fall asleep. We had sleep trained and she had become very consistent every night, only waking up once or twice a night. She won’t take a bottle or soother so those are not options to help her fall asleep. What can we do about this? Thank you for visiting us. I am sorry to hear that you have been struggling with sleep since moving! Moving can be a common hurdle for sleep, but the good news is that your little one WAS sleeping well, and she can get there again! Stay consistent, and if things do not smooth out in the next few weeks, please consider our Members Area, which gives you access to all of our e-Books as well as tele-seminar recordings, case studies, do-it-yourself tutorials, and more! My favorite feature is the access to “members only” expert chat sessions, where one of our sleep consultants will answer your specific questions live via chatroom! The Members Area subscription is very affordable, and available in sizes to fit all budgets. Members also receive 20% off of ALL personalized sleep consultation services, should you find that you would like more personalized assistance. 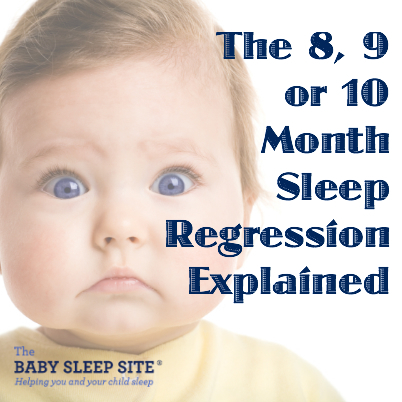 Can the 8,9, or 10 month regression happen early? My 7 1/2 month old just recently started sleeping a little better (around the 6 month mark). The 4 month regression hit us hard ?. His napping also just started lengthening out passed 40 minutes not too long ago- except now, when he wakes up to eat at night, one of those times he will not go back to sleep, and he can be up for over an hour. It’s always rolling onto his stomach, then being mad because he’s on his stomach. He is doing the same with his naps now. Right around the 40 minute mark, he starts crying, and I check on him and he’s in his stomach. I just started to feel like his sleep was leveling out a little… ?. He is also teething, but I have a hard time thinking that would be keeping him up while he’s rolling around. He has been rocking back and forth and trying to figure out crawling, and it does seem like he’s trying to pull himself up. He loves to stand. Anyway, just curious if this sounds regression-ish. Thanks for visiting The Baby Sleep Site! I’m sorry to hear your son is having these issues with naps and night waking recently. Very occasionally, this regression will happen early, but to me it sounds more likely that the sleep issues are related to him learning to roll. Milestones like learning to roll, crawl, and walk can interrupt sleep temporarily, but it’s usually not for too long! You might like our article on dealing with a baby rolling here: https://www.babysleepsite.com/baby-sleep-comfort/baby-rolling-over-in-sleep/ Hope that helps, and good luck! My 10 month old used to sleep through the night until he got the flu. As soon as he got the flu a couple months ago, he rarely sleeps through the night. Now, suddenly, each time I lay him down for bed at night, he starts screaming and takes a while to fall asleep. He keeps waking 1-3 times each night where I have to feed him. We try to let him sleep until 6 am but hes usually awake between 5-5:45 each morning. Then he takes a catnap somewhere between 7:15-8:15. At daycare, they try to let him nap around 9:30 and sometimes he sleeps then. If he doesn’t, their next nap isn’t until 1:30. At which time I feed him and he falls asleep nursing. Hen he’ll take a catnap on the way home from 5:30-5:50/6. I usually try and lay him down for bed between 7-7:30. Am I doing something wrong with his bedtime? Best of luck to you, and hang in! My 9.5 month old has always slept reasonably well in the sense that she naps right on time and goes down well. Napping 10-11/11.30 and 3-4 then asleep 7.30pm-6am. However, she has always woken once or twice in the night. I have always responded by feeding her as she has a good long feed, falls asleep on me, burps and goes down contented. I’ve often wondered if I have just given her a sleep association but as she does take a lot of milk and then stays asleep, I felt she may just need it? However, for the last couple of days she’s been having shorter naps and waking maybe 2-3 times instead of 1-2 but still feeding well, if not more. I’m trying to wean her in the day of course so is this a sign she’s just not getting what she needs in the day? Will she naturally drop these night feeds or have I set myself up these problems? I should perhaps also add that she rarely wakes at the same time in the night. Sometimes it can be early on and then she doesn’t wake again until its time to get up at 6. Other nights it can be 1 am, 3 am, 5.30am and then wake at 7.30! Hang in there and I hope things improve soon! Did you ever figure this out? It’s exactly my situation! And I’d love to know if the feed in the middle of the night is a sleep association or not! My 8 month old baby was sleeping through the night (for the most part), and now he is waking up multiple times, consistently for the past 2.5 weeks (and not settling down until after at least 30 min of fussing)! I have only gone in on one occasion to check on him, and he doesn’t seem hungry. He has never been good with DWT, although I always wait till 7 to get him..
His schedule is: 7:00 nurse & solids, 9-10:15(ish) nap, 11:00 nurse & solids, 1-2:45(ish)nap, 3:00 nurse & solids, 5:15-5:45 cat nap, 6:30 nurse & solids, 7:30/7:45 bed. Would love suggestions! Suggesting an earlier bedtime or later DWT isn’t possible or my baby would never see his daddy. Do you think this catnap needs to be dropped? If so, what kind of routine do you suggest, because obviously my baby can’t go from 2:45-7:45 awake in the evenings. @Jenny – Thank you for writing to us. I am sorry to hear you are struggling with your son’s sleep recently. It does sound like it’s likely a result of the sleep regression so hopefully things will smooth out for you in the next few days. I totally understand the bedtime/wake time needing to be different so he can see his dad (I am in the same boat) so remember it’s a sample and you can certainly put your adjustments in. As you’ll see on the schedule, the catnap is optional at this point but since he can’t go down any earlier, you probably should hang on to it a little longer to prevent him from getting overtired. I hope things smooth out for you soon, but let us know if they don’t and we will point you in the direction of more resources. Thank you for using the Baby Sleep Site!